Challenge your mates—and your mind—with chess, boules, quoits and other outdoor games in New York parks. Forgot to pack a frisbee? Don't sweat it—plenty of parks in New York City have activities on offer. 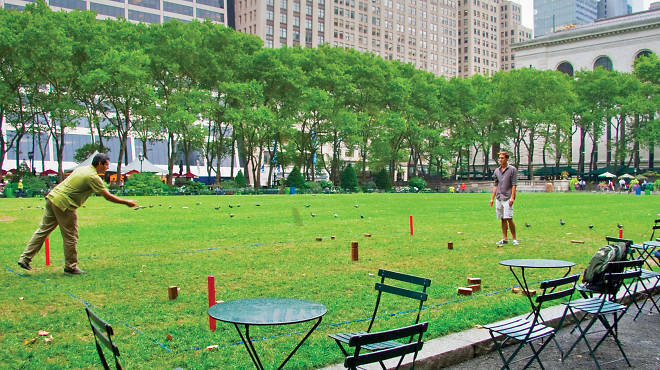 Gather some friends for pétanque, show off your Ping-Pong serve, or submit to a board-game battle of wits; here's where to play games in New York parks. These two variants of boules are played in back of many a bar, but breezy afternoons are made for practicing your aim in the shaded greenery of a park. Both Italian bocce and French pétanque are a test of accuracy: Toss your balls to get closest to a smaller target ball on the far side of the court, knocking your opponent’s out of the way if you have to. Most park facilities don’t include a ball set, so bring your own or challenge other players to a friendly pickup game; it’s not uncommon to encounter organized leagues and meet-ups. If you don’t know how to play, the seasoned experts at La Boule New Yorkaise offer free weekday pétanque lessons at Bryant Park (11am–6pm Apr–Oct). Heated chess matches are a familiar sight in Washington Square Park, and confident players are welcome to flaunt their strategy in pickup games (be warned—the skill level here is high). Checkmates also regularly go down in Forest Hills’ MacDonald Park, where locals gather for impromptu games. Beginners might be better off in Bryant Park, where chess sets are available to rent (30mins for $3) along with backgammon boards (30mins for $4). There’s also a free selection of other board-game favorites that run the gamut from cerebral to silly, including Scrabble, Jenga, Apples to Apples, Chinese checkers and Bananagrams (all sets available 11am–7pm on weekdays and noon–9pm on weekends, Apr–Sept). In addition to pétanque and board games, Midtown workers and shoppers can find even more reasons to take a break with Bryant Park’s more unusual offerings (daily 11am–7pm, April through September). The object of kubb, which hails from Sweden, is to knock over your opponent’s blocks by tossing sticks at them. It may sound simple, but the game is nicknamed “Viking chess” for a reason; park attendants are available to teach you the nuanced rules and tactics of play. For a more straightforward option, try your hand at quoits, a close relative of horseshoes. Each player gets two quoits (rubber rings) to toss at a spike in the ground; whoever gets closest—or, even better, throws a “ringer”—wins. Those of us without basement rec rooms can still partake in a rousing table-tennis match: Tompkins Square Park and Luther Gulick Playground are both home to permanent concrete tables. While you won’t find paddles and balls on-site, neighborhood shops cater to the demand; invest in a two-paddle, two-ball set ($18.95) at Alphabets (115 Ave A between E 7th St and St. Marks Pl; 212-475-7250, alphabetsnyc.com) or stop by G & S Sporting Goods (43 Essex St between Grand and Hester Sts; 646-213-1100, gandssportinggoods.com) for $3 paddles and six-packs of balls for just $2. Tables can be found near the northwest corner of Bryant Park; equipment is available to use free of charge (daily 11am–7pm Apr–Sept, 11am–6pm Oct–Nov) by signing up with the park attendant—just be prepared to wait for a time slot (15 minutes, you can play for longer if it’s not busy) behind other ’pong lovers.